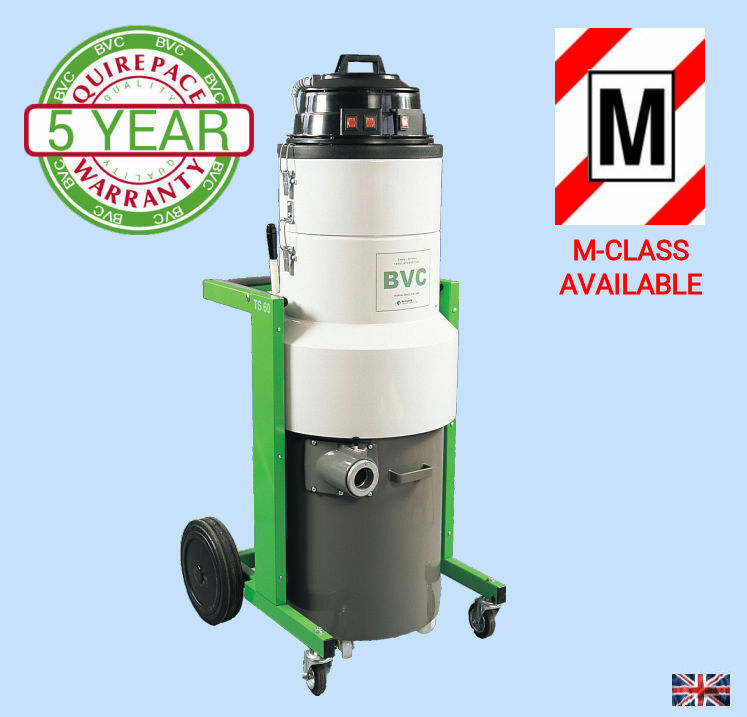 Manufactured here in the UK by Quirepace, the BVC Tower TS60 Industrial Vacuum Cleaner delivers big performance with a highly manoeuverable design. With several different motor, filtration and hose options, the Tower TS60 can be configured for best performance, whatever the application. When a big performance Industrial Vacuum Cleaner is required with the flexibility to operate from standard power outlets and yet be manoeuvrable enough to easily pass through standard single doors, then the BVC Tower TS60 delivers the solution. The “Tower” is so called because it places each stage of the machine one above the other, providing space for a large capacity drum, high performance filtration stages and a multiple motor head providing options for 110v and 230v supplies. The 110v options offer either 2 or 3 motor heads with 1.8kW and 2.7kW respectively, whilst the 230v option has 3 motor 3kW performance. Motors have thermal protection as standard. As you would expect from BVC, The Tower TS60 isn’t just offered in a single configuration. In addition to different motor choices, several hose options are offered. Tower TS60 has a 76mm drum entry and using standard adapters 76mm, 51mm and 38mm hoses can be used. “Y” piece adapters add even more flexibility by allowing two hoses to be used simultaneously by two operators. Where electrical outlets are in short supply, for example in warehousing applications, the Tower TS60 has the performance to utilise, for example, a 15m long hose, providing a huge 30m cleaning radius without moving the machine itself. The ability to use long hoses is also beneficial in any floor preparation application, such as concrete grinding, allowing easy cleaning of the workface. The power to utilise long hoses makes TS60 ideally suited as an agricultural vacuum cleaner for farm use. 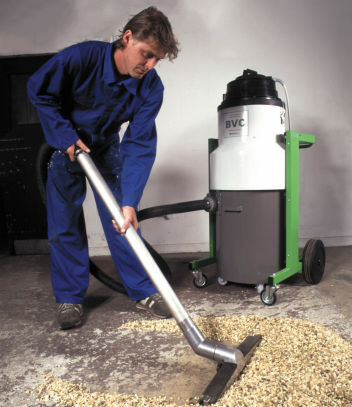 The large, easily emptied tank, combined with excellent filtration to M Class standard, and the option of wet pick-up delivers versatility and performance combined with the robustness all BVC professional vacuums offer. The BVC Tower TS60 is offered with two different filter designs; either a “standard” filter providing 0.67 sqm of filter area, or the BVC “Clearflow” filter which provides 1.65 sqm of filter area. 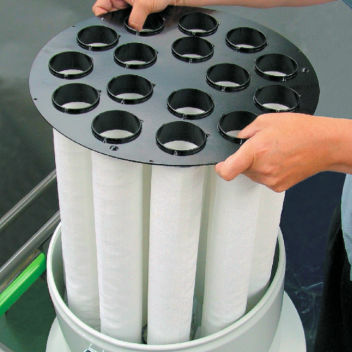 The “Clearflow” filter is unique in this size of machine providing 16 filter “socks” which dramatically increase the available filter area ensuring lower air flow speed and less clogging. A filter shaker helps to ensure performance is maximised. Apart from different designs, filters can also be supplied in different materials for different applications, so the user has options for HEPA filters, antistatic and PTFE coatings and heat resistant materials. For Wet and Dry applications a swarf basket can be used to separate the cleaned material from any liquid. making the TS60 particularly suitable for metalworking and machine shops. The TS60M is provided with filtration that has been rigorously tested to comply with the standard for M-Class vacuums. This standard not only refers to the particulate size the filter is designed for, but also burst and stress tests to ensure that the filtration system can withstand prolonged use. The TS60M has a 2 stage filtration system consisting of the unique BVC “Clearflow” filter combined with a cartridge filter to deliver efficient filtration. The TS60M is fitted with a filter shaker. In compliance with the M Class standard, The Tower TS60M is fitted with a warning lamp which lights up when the air flow drops below 20 m/s (when using all 3 motors), indicating that the filter may be becoming clogged. As is already mentioned, the upright design of the Tower TS60 provides a small footprint. Manoeuvrability is enhanced with BVC’s usual large castors and wheels and strong and stable chassis. 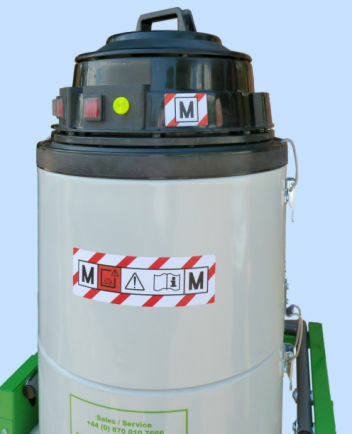 The drum is also provided with castors to aid emptying, and for applications where the material to be cleaned is very heavy, an optional drum lifter is available to aid detaching and emptying the drum. Within the drum there is the option to use a plastic bag, or where a wet application is required a swarf basket is used. The wet version of TS60 incorporates a float valve to prevent over-filling. Designed primarily to deliver performance in a manoeuvrable design, the phenomenal performance of the BVC Tower TS60 can be extended with the use of interceptors to increase capacity even more. Like all BVC Vacuum Cleaners in the Industrial Range, the Tower TS60 is designed for a hard life in tough environments; its robust construction using heavy gauge materials ensures long life. Our experienced sales consultants will guide you through the choices of motor, vacuum, filtration, hose dimensions and tools to ensure that the machine is perfectly specified for your application. Our factory in Fareham will build your machine to your specification, test it, and on delivery, we will commission it and carry out user training. With a 5 year parts warranty and service available nationwide through our own service and maintenance department, theTower TS60 is the optimum choice when you don’t want to compromise durability and performance.